The FCC on Tuesday finally rolled out its plan to kill off net neutrality. There’s a strong chance that doing so will screw over millions of American consumers and lead to a rise in online censorship across the US. But on the hand, it will make internet service providers and mobile carriers a shitload of money. The vote to repeal net neutrality will be held by the commission on December 14th, according to a statement from FCC Chairman Ajit Pai. Pai has painted his efforts to grant companies like Verizon broad authority to control which websites its customers can access as “restoring” the internet to its former glory. Republicans control three of the commission’s five seats, giving them the majority needed to pass the new rules. 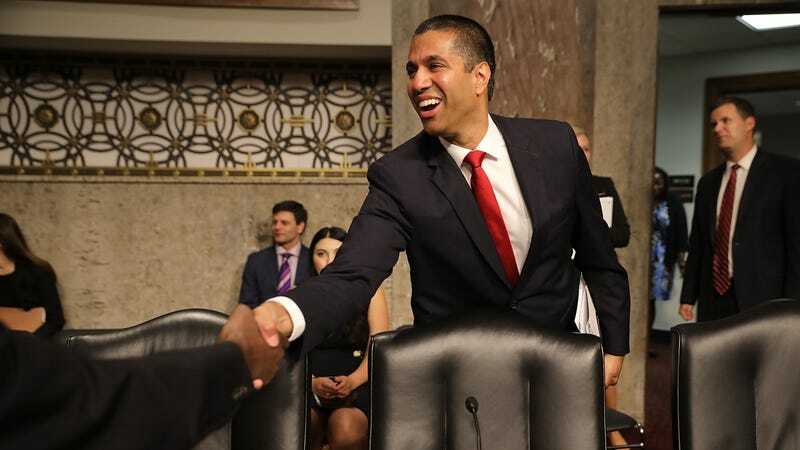 Since being appointed chairman by President Donald Trump in January, Pai has been determined to roll back the Obama-era net neutrality rules, which reclassified internet providers as “common carriers” under Title II of the Telecommunications Act. The reclassification allowed the FCC to regulate internet providers, such as Verizon and AT&T, and make it illegal for ISPs to discriminate against content by blocking or slowing traffic to websites whenever they choose. Pai has repeatedly claimed that net neutrality has forced broadband providers to decrease their investments. But that’s a lie. Pai added that his plan will require internet providers to be transparent and allow consumers to “buy the service plan that’s best for them.” The responsibility of policing ISPs will be transferred back to the Federal Trade Commission, as it was before the net neutrality rules were approved in 2015. FCC Commissioner Jessica Rosenworcel called Pai’s justifications “ridiculous” and “offensive” to American consumers. “Following actions earlier this year to erase consumer privacy protections, the Commission now wants to wipe out court-tested rules and a decade’s work in order to favor cable and telephone companies,” she said. Congressman Frank Pallone Jr., the ranking Democrat on the House Energy and Commerce Committee, noted that millions of Americans have spoken out in defense of net neutrality. “In making this announcement, the Trump FCC is choosing to ignore the public and push forward with a harmful plan to kill net neutrality and destroy the internet as we know it,” he said.